Not to be confused with Pouilly-Fumé from the Loire Valley. Château de Pouilly with adjacent vineyards. 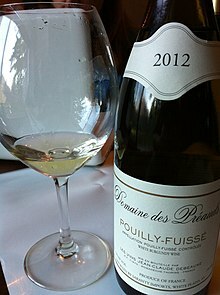 Pouilly-Fuissé (French pronunciation: ​[pu.ji fɥi.se]) is an appellation (AOC) for white wine in the Mâconnais subregion Burgundy in central France, located in the communes of Fuissé, Solutré-Pouilly, Vergisson and Chaintré. Pouilly-Fuissé has Chardonnay as the only grape variety. While Pouilly-Fuissé is the best-known part of Mâconnais, there are no Premier Cru vineyards within the AOC, as the local growers at the time the regulations were being drawn up never applied for this. The AOC was created on 11 September 1936. The area used to be known simply as "Pouilly", but when the AOC laws were introduced, it was split into three: Pouilly-Fuissé, Pouilly-Loché and Pouilly-Vinzelles. Despite the lack of official classification within the AOC, some climats within Pouilly-Fuissé have better reputations than others. Pouilly-Fuissé is a dry white wine made from Chardonnay grapes. It is pale and refreshing, often quite delicate, and often shows a clear oak influence. On average these wines sell for much less than the white wines of Côte de Beaune to the north. West of Mâcon the land rises up to form Mont de Pouilly and other limestone hills, covered in the alkaline clay that best suits Chardonnay. The villages of Vergisson, Solutré-Pouilly, Fuissé and Chaintré shelter at their feet. In 2008, 757.20 hectares (1,871.1 acres) of vineyard surface was in production within the Pouilly-Fuissé AOC, and 39,147 hectoliters of wine were produced, corresponding to 5.2 million bottles of wine. The AOC regulations only allow Chardonnay to be used. The allowed base yield is 50 hectoliter per hectare and the grapes must reach a maturity of at least 11.0 per cent potential alcohol. The négociant Georges Duboeuf of the Beaujolais wine region grew up on a small vineyard in the region. In the Season 5, Episode 6 of The Mary Tyler Moore Show entitled "I Love a Piano", Murray returns to work intoxicated after having had a long lunch with a divorcee. When Lou asks him what he has been imbibing, he replies, "Pouilly-Fuissé." Lou says, "Too bad [...] I've been a news man for thirty years. I've sobered up guys who were drunk on everything from Scotch to aftershave lotion. But never once in my life have I had to sober up anyone who was drunk on Pouilly-Fuissé. I don't know what to do. I don't know whether to give him black coffee or cheese!" In the Frasier episode "Three Dates and a Breakup: Part 2," Frasier Crane refers to a 1992 Pouilly-Fuissé as "the nectar of the Gods." Jimmy Buffet's song "Landfall" contains a reference: "Oh, I love the smell of fresh snapper fried light; What'd you say, Pouilly-Fuisse could round out the night." The wines of Pouilly-Fuissé should not be confused with the Sauvignon blanc-based wines of Pouilly-Fumé and the Chasselas-based Pouilly-sur-Loire, both from the area around Pouilly-sur-Loire in the Loire Valley. ^ Johnson, Hugh (1985). The World Atlas of Wine, 3rd Ed. Mitchell Beazley. ISBN 0-85533-562-9. ^ Langley, William. (2006-09-07.) "The King of Beaujolais takes a tumble." (News website.) Telegraph.co.uk. Retrieved on 2007-10-04. This page was last edited on 24 March 2019, at 18:59 (UTC).